HomeChina-bashing is taking its toll. ← Airline fees go through the roof … but are we actually surprised? As someone who lives in Southeast Asia, and who also builds and markets computer software for businesses, my attitudes toward China have definitely soured over the past few years. What are euphemistically termed China’s “technology transfer policies” have completely driven my company out of the Chinese market, which owing to rapid expansion of the Chinese economy we once regarded as a lucrative opportunity for growth. For example, accounting software cannot be legally sold in China without official “certification” which (surprise, surprise) is awarded only to Chinese firms. To get around these protectionist restrictions, some Western software makers have formed joint ventures with Chinese software houses in the past, only to discover that under Chinese law their joint venture partners are entitled to the source code, making it ridiculously easy for the partners to create competitive Chinese-branded copycat products. Finally, even after Chinese customers are enticed to buy from Western firms, they almost never pay their bills. As a result, software makers end up transferring their intellectual property the Chinese way — for free. China’s neighbours in Southeast Asia rightly see those Chinese military fortifications in the South China Sea as a direct threat, because they lie within waters claimed by the Philippines, Vietnam, Malaysia and Brunei. Those claims are valid under the United Nations Convention on the Law of the Sea (UNCLOS) to which China (but not the U.S.) has acceded. The Philippines’ UNCLOS claim was upheld by an arbitration tribunal in 2016, but China (and also Taiwan) have rejected the tribunal’s ruling. China’s assertiveness in the resource-rich South China Sea presents both an economic and a military threat, affecting especially the commercial fishing, oil and gas industries as well as the freedom to navigate one of the world’s busiest shipping lanes. Most recently, an increasing number of countries are spurning China’s One Belt-One Road (OBOR) overtures. Under its OBOR initiative, China contributes substantial sums of capital for and know-how to build critical infrastructure across Asia, Africa and even Europe — ocean ports, railways, pipelines, hydroelectric plants and the like — but on very onerous financial terms in the event (rather likely in Sri Lanka, as it turned out) that those projects fail to generate enough revenue to pay China back. Most recently, Malaysia’s Prime Minister Mahathir Mohamad cancelled several Chinese-funded multi-billion dollar infrastructure projects two months ago. “It’s about pouring in too much money, which we cannot afford, cannot repay, and also because we don’t need these projects for Malaysia at this moment,” he said. Here in Thailand, where tourism is an important industrial sector, Chinese holidaymakers are flooding local tourist attractions and shopping venues. Though they appreciate the economic shot in the arm, the Thais are nonetheless horrified by Chinese manners, which are so poor that even the Chinese government is trying to educate its citizens before they go. The term “ugly American” ceased to be bandied about many years ago. 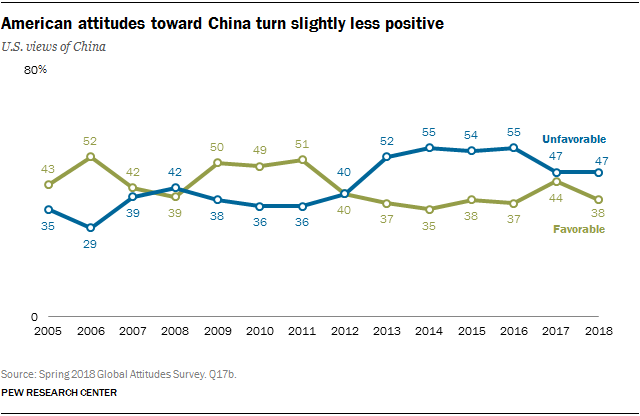 It’s becoming increasingly clear that the conduct of the Chinese central government, and that of its citizens, is tarnishing China’s reputation in Asia and, according to Pew Research, in the U.S. as well. Now that Xi Jinping is President for life, I doubt China will volunteer much of anything to improve its international reputation in the years to come. Improvements will come only when other countries — like the U.S. and Malaysia — push back on trade policy and Chinese largesse.